Jethro done knocked mah laundry inta tha cee-ment pond! Admit it. Those of you over 40 hear Daisy May Moses screaming this out every time you look at it. Still, there probably isn’t a voter in this country that doesn’t know who Jeb Bush is. Despite laying low in Florida behind that lackluster job market, his secret identity has somehow been sussed by those pesky, meddling kids. Damn bloggers! But what exactly is the story behind this brand of bland flavored potato chips? It all started back in 2002 when future political poison pill Mike Murphy was picked to run a gubernatorial campaign for plain old Jeb Bush. Murphy had a marketing brainstorm: divorce the candidate from his past by 1) burying his surname in a box under an oak tree at new moon and 2) create faux buzz by pasting a big exclamation point where it used to be! It was a strategy that went over like sliced bread with decaying retirees, their brains weakened by the harsh Floridian sun, and candidate Jeb! was born! It’s easier to find Waldo than Jeb! on this page. And check out that big slogan in the center; bright, huge, clear, bold type that screams for an exclamation point and… bupkiss! You may as well set it in lower case twelve-point courier and make it 50% gray. This is a baker’s dozen of ho-hum. If you’re going to run your brand on a gimmick, aim for consistency. Now designers will tell you that a good logo should convey the essence of the product. This is mostly trade babble used to justify astronomical paychecks, but there is a grain of truth there. 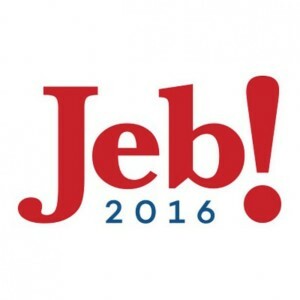 So what does Jeb! tell us about the product? That it’s easily excited? That it’s imperfectly assymetrical? That it’s going to grab 2016 with both feet and never let go? Or that the product, Jeb!, is hiding from reality. 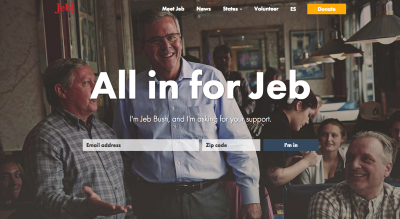 Not only has he dropped his toxic surname, but Jeb isn’t even his real name! I polled two dozen alcoholics and only three guessed his real first name. Go ahead, guess! Nope, it’s John. John Ellis Bush. Get it? J-E-B. We’re not thinking of potato chips anymore. We might be thinking of jumping some double-deckers on a Harley. In a cape. Dump the fuddy-duddy, weak-chinned, redneckiness and misshapen punctuation of Baskerville for the bold strength and downright uprightness of Minion Black! Three capital letters which relay the nickname and enforce the initials, underscored by three stars and three stripes [a hidden triple exclamation!!!] representing the three Bushes who would be King! You can’t escape your past so use it, brother! Put it right there in front, warts and all, and show the people you aren’t afraid or ashamed of anything or anyone! But, as they say on the infomercials, there’s more! Symbolism within symbolism. Like Shakespeare. Or Watchmen. But nobody dies! We aren’t all that excited about you dragging Murphy out of his coffin, so maybe you could call us personally about this, kk? We promise not to tell him!